Welcome to the first episode of the Whispers from God for Every Mum podcast. In this episode Kate introduces herself to you, and discusses what this podcast is all about. We look in the Bible at Psalm 1:2-3 and a few other passages to see why being in the Word is so important for us Mums. Who Kate Moala (Your host) is. Psalm 1:2-3 – the Theme for this podcast. 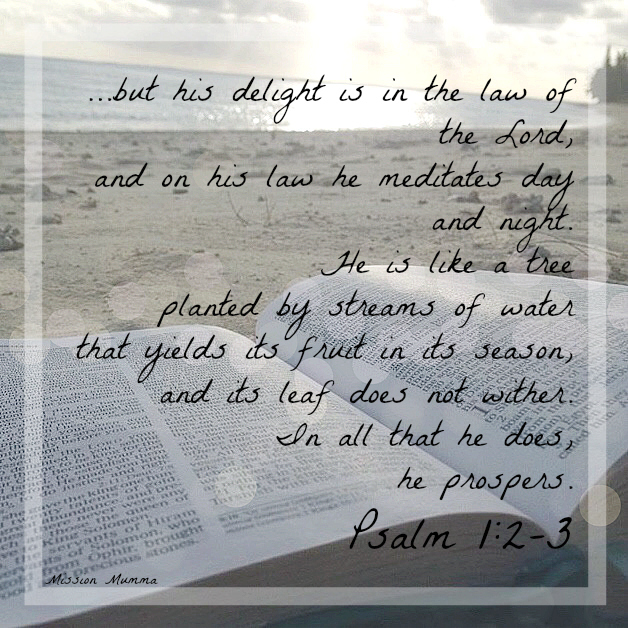 To Access the free printable for Psalm 1:2-3 click here! You just need to save it to your device and then print it on whatever size you like – I would love to see where you use them, tag your pictures with #whispersfromgodprintables or tag me @missionmumma in them. I’d love to keep talking about this episode or anything to do with Grace and Faith in Motherhood. Have a great week Mummas! !